Mobilize? Bring your own Device! 2011 was the first year where the sale of electronic devices like smartphones and tablets beat the number of PC´s sold. It is a completely logic effect regarding to the improvements in functionality. Many of these devices now have functionality that is equal to the laptop or home computer of only a few years ago. In particular businesses benefit from mobile devices that provide access to email, calendars and business documents as well as the possibility of flexible working arrangements. When I worked at Rohde&Schwarz International Operations the company provided it´s employees with all the required tools and equipment that they need to perform their jobs; this has been true for large organizations. But for smaller enterprises that do not have the money to provide their people with everything, the employees bring their own tools to work. 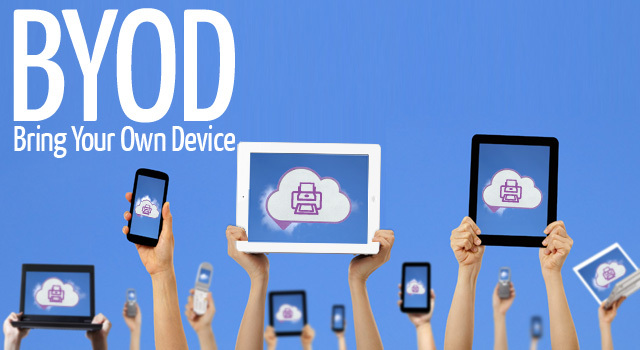 And this strategy has a name: Bring Your Own Device Model or simply BOYD Model. When employees bring their own devices, they can work more comfortably and the employer saves on hardware costs and maintenance while the data security issue is handled by the cloud application. Since Julia wrote about Cloud Computing in her last blog I don´t need to explain that term again. Cloud Computing’s role is one of security. Services like desktop hosting allow the entire desktop environment of your office pc to run on any device with a big enough screen and internet connectivity. Even if employees use their own devices for work, the employer is able to control which applications and what data are accessible and where, preventing it to be even saved locally, only on the cloud desktop environment. citing research from Good Technology. BOYD – Bring your own disaster? Privacy –The informtion law group cites the “creep-out factor”. It means that most employees are afraid of an invasion into their privacy. The computer they use for work will also be the same computer they surf the web or use to sign up into Facebook and Twitter. Employees are suspicious towards their company of being able to “spy” on them and have access to their personal passwords, websites and data. Now, Intels workers need to sign an agreement about when they have had access to their e-mails, calendar etc. We’ve all become dependent on connectivity and computation, turning us into tablet- and smartphone-toting cyborgs. How will this trend evolve in 2013? I got so much used to my mobile devices like my iPad or iPhone that I tried to open Mozilla Firefox by touching my work computer´s screen. BOYD was voted among the Top-Tech-Trends 2012 a couple of times by different rankings such as carouselconnect , petri, or by the bigfatfinanceblog. In my opinion this trend will become increasingly popular in 2013. More and more, particularly small and middle-class firms will adopt this model to safe money. And with an increasing number of freelancer due to outsourcing, Enterprise Mobility is essential for companies to correspond with their on-road-employees. But not every phone works on every network abroad so it´s useful that every worker has his/her own device. Another point might be the growing technical knowledge of the next generation. We are facing an unbelievable variety of mobile devices therefore every individual has his/her own preferences regarding their mobile friends. With the BOYD Model they won´t be forced to work with a provider or brand that they absolutely don’t like. 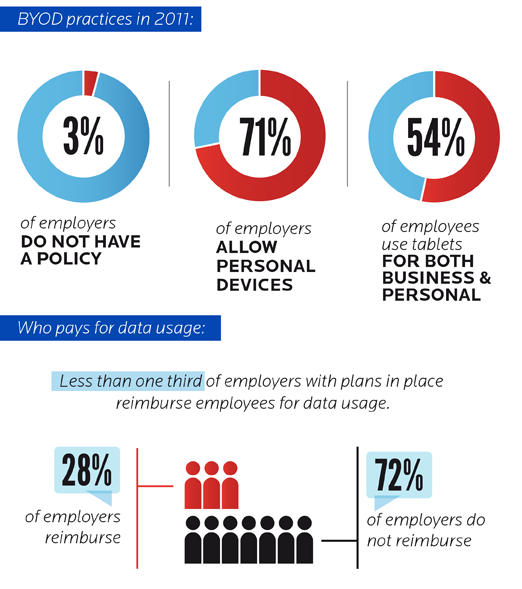 The chart on the left shows that 71 percent of employers already allow personal devices in the office. That´s a big percentage with increasing tendency! 2013 will give us the final answer, I am curious! This entry was posted in Connectivity & Mobility, Enterprise Organisation, Enterprise Strategy and Psychology and tagged BOYD, connectivity, device, Enterprise Mobility. Bookmark the permalink. I am so glad you commented on my post, this forces me to also have a look at yours and others. So far I have only commented on my group-members’ work but to go beyond this border is so interesting. Because in your post, I discovered a whole new style of writing: you’re writing very professionally and very detailed and I’d say you are also writing in a scientific way. And also so, so thoughtful. I like that. I can see, you must’ve spent some serious time on that!! You relate your research findings to education and business and technology as said and recommended by bruce. You are not only presenting benefits (save costs) but also withdraws (privacy, data security) of BOYD, which is cool. I haven’t read about this model before, although i had quite a similar topic. but good to know. Including catchy facts, like the sale of smartphones and tablets beating the number of PC’s sold is successful. This brings the “a-ha”-moment to the reader. Actually, I don’t have many negative points. Only that I missed a personal story behind it. Because somehow, it was so much text (maybe you can include more pictures 4 ppl like me) and some facts that loosen the scientific part a little. however, I couldn’t imagine of anything wrong in your blog post. I mean you respected each directions that we learned in class: you’re analyzing a trend with bravery, structure is good, appropriate and interesting subheadings (nice wordplay: “bring your own disaster”), you included a poll and pro’s opinions (keating, silva, garlati), you included hyperlinks that lead to other interesting pages (e.g. other blog posts of fellowstudents), at the end you’re telling us your point of you, which is so thoughtful again: because you are trying to understand each side: big and small businesses, you’re thinking of the employees, about the outsourcing-problem, you are even explaining the chart you included in your post, you added tags. You simply go beyond your borders and comfort zone. I bet this was a lot of work! You did a wonderful job. I learned something from you – thanks a bunch! Take care!